In terms of games, the 2008 Division I Minnesota American Legion Baeball Tournament is half over. But with 16 games completed, the tourney is just gathering steam with 12 teams still vying for the two slots to the national regionals. In perhaps the marquee matchup of the day, number-one-ranked Eden Prairie and number-two-ranked Grand Rapids battled 12 innings before the northern team pulled out a 12-9 win. The teams were tied 4-4, 5-5, and 6-6 before Rapids knocked knocked home six in the 12th. Eden Prairie scored three in the bottom half of the inning. Moorhead, Cold Spring, Richfield and ambridge were out of the tourney after losing two on the first day. Edina, St. Cloud, Rochester, and Eastview went undefeated to stay in the winners' bracket. All the games today will be at the two fields in Alimagnet Park, Rich VanderLaan and Bob Bunnell. The two winners' bracket games will be at 4:30 and 7:30 at VanderLaan Field. Eastview will play Rochester in the early game, and Edina will play St. Cloud in the early game, and Edina will play St. Cloud in the early game, and Edina will play St. Cloud in the 7:30 contest. Play will continue through Sunday with the championship game at 3:30 p.m. The winners will go on to national regional contests at Minot, ND, and Chillicothe, Phio. This year's World Series is in Shelby, North Carolina. Play will begin in Sacred Heart in west central Minnesota today in the Division II tournament. Teams vying for the Division II title are Jordan, Pipetone, Staples-Motley, Red Lake County, Wheaton, Ely, LaCrescent, and host Sacred Heart. Kent Rolfing traveled 1,400 miles round-trip to watch grandsons Ty and Cody Groskreutz play for Eastview in the 2008 State American Legion Baseball Tournament. Rolfing played in the South Dakota State Legion Tournament 50 years ago. Fifty years ago, Kent Rolfing played for Rapid City in the South Dakota State American Legion Baseball Tournament. He is reliving his youth this week in Burnsville, watching his grandsons Ty and Cody Groskreutz play for Eastview. While it is not unusual for a grandparent to watch his grandsons play, Rolfing gets this years prize for dedication. The trip to Burnsville will wind up being a 1,400-mile journey from his home in Rochester Hills, Mich.
Rolfing played center field in his Legion days. Rapid City was just starting to be a force in Legion baseball when he played. Rolfing said he is pleased to see that the ideals of American Legion Baseball have not changed over the years. For a team that relies heavily on pitching and defense, New Ulm Gold sure hit the ball well in a 12-10 first-round victory over the Richfield Reds at Alimagnet Park Thursday morning. French made the most of his first state appearance, as he went three-for-four in the Richfield game. Zach Fischer added two hits and three key RBI for the winners, who draw players from New Ulm and New Ulm Cathedral High Schools. I went up there looking for the first pitch, said Fischer. It is a big relief to get past the first game. French and Fischer agree that it is fun playing for New Ulm Gold coach Doug Radloff. Fischer, a junior at New Ulm Cathedral High, said he will also be back with New Ulm Gold next season. Zack Fischer of New Ulm launches the game winning hit vs. Richfield. Eastview and Willmar battled for more than three hours in a first-round game at Alimagnet Park on Thursday morning. Center fielder, Patrick Coyne had four of Eastview's 19 hits, while shortstop Nicholas Gorski had three. Jordan Smith had four hits, including a home run, for Willmar and had five RI. Mike Dunham added three hits for Willmar. Eastview is closing in on the 30-win mark with a 28-8 record. Barry, Wobschall(5), Jensen (7) and PEters. Smith, Malmgren (4), Jacobson (9) and Malmgren, Koenen (4). WP Barry. LP Smith. Home Run: Smith, Willmar. Maple Grove outhit Cold Spring 12-9 at Alimagnet Park Thursday afternoon. Kurt Peterson drove in five runs for the winners and teammate Travis Kulla had three hits and three RBI. Brian Hansen led Cold Spring with three hits. Vossen, Willenbring (6), Theis (7) and Skluzacek. Greene, Gorsett (4) and Enger. WP Gorsett. LP Vossen. Home runs by Brian Ness and Kris Long powered the Rochester Patriots to an 8-3 victory over the Moorhead Blues at Red Haddox Field in Bloomington. Spencer Brrady picked up the win on the mound and went four-for-six at the plate. Joe Pieterick and Braden Rahman hit doubles for Moorhead. Brady, Anderson (6) and Nelson. VanDyke, Bernhardt (2), Petry (4), C. Smith (4), Pieterick (5) and Schlotfeldt, Cahill (6). WP Brady. LP Van Dyke. Home runs: Ness, Rochester Patriots; Long, Rochester Patriots. 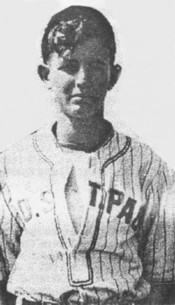 Erik Hovet came to bat seven tines and delivered four hits as Grand Rapids won the first-round game at Bloomington's Red Haddox Field. Bill Martinetto went three-for-four for Grand Rapids, while Joey Wntzel and Scott Linder eah had three hits for Eden Prairie. The game started as a pitchers' duel between two of the state's best Gabe Wood of Grand Rapids and Madison Boer of Eden Prairie, but neither of them made it out of the seventh inning. Wood, Kleindorst (7), Skrbec (12) and Shaw. Boer, Lindner (6), Wiley (7), Stremke (9), Bado (10), Gotham (12) and Halloran. Apple Valley outlasted North St. Paul 13-12 in a first-round slugfest at Prior Lake's Memorial Park. Brandon Peterson, Cory Eul and Aaron Gretz homered for the winners and Matt Puhl contered witha grand-slam homer for North St. Paul. Apple Valley's Boomer Hermes hit a sacrifice fly in the bottom of the eighth to score Erik Fabry with the winning run. Puhl, Humbert (4) and Rubbelke. Radde, Fangel (6), Sampson (8) and Peterson. WP Sampson. LP Humbert. Home runs: Puhl, North St. Paul; Peterson, Apple Valley; Eul, Apple Valley; Gretz, Apple Valley. Collin Stinogel of the St. Cloud 76ers pitched a complete game and hit a home run to lead the St. Cloud 76ers. John Denne also homered for the winners, while Matt O'Connor hit a homer for Cambridge. Mitch Wieneke had four hits and four RBI for St. Cloud. Stinogel and Blitvich. Nelson, Gerlach (6) and Valentyn. Home runs: O'Connor, Cambridge; Denne, St. Cloud; Stinigel, St. Cloud. New Ulm Gold and Richfield combined for 33 hits in the opening round of the Division I State American Legion Tournament at Alimagnet Park in Burnsville Thursday morning. Kyle Fischer pitched a complete game for New Ulm Gold, facing 51 batters. Garrett Fischer and Wade French each had three hits for New Ulm Gold and Zach Fischer added two hits with three RBI. Richfield catcher Adam Seaman had a big day at the plate, going five-for-six. K. Fischer and French. Olson, Blunt (8) and Seaman. WP K. Fischer. LP Blunt. Home run: Altman, New Ulm Gold. Edina left-hander Cole Nelson excelled on the mound, and Burnsville's Anders Engberg went all the way in the best pitchers' duel of the tournament thus far Thursday afternoon at Alimagnet Park. Edina center fielder Andy Bartz doubled in the bottom of the eighth and scored the eventual winning run on a single by catcher Erik Nelson. The win raised Edin'as season record to 20-15. Engberg and Harazin. C. Nelson and E. Nelson. WP C. Nelson. LP Engberg. Matt Seehusen had five RBI as Willmar stayed alive in the losers' bracket Thursday at Alimagnet Park. He had a triple and a single and also drew three walks. Jordan Smith of Willmar went three-for-four with a double. Brian Hansen hit a triple and had two RI to lead Cold Spring, whch finished the season with a 28-5 mark. Anderson and Malmgren. Schroeder, Lardy (5), Theis (5), Backes (7) and Skluzacek. WP Anderson. LP Schroeder. Pither Nick Dolsky of Eastview went the route, striking out 11 and allowing seven hits. Erik Klefsaas and Joe Peters each had two hits for the winners. Craig Hanken of Maple Grove had two hits and two RBI. Travis Enger also had two hits for Maple Grove. Dolsky and Peters. Wenker, Cossettte (8) and Enger. WP Dolsky. LP Cossette. Daniel Fagerhaug, Lucas Skjefte and Madison Boer each had four hits as Eden Prairie cruised to victory Thursday afternoon at Red Haddox Field in Bloomington. Eden Prairie scored 13 runs on 13 hits, with the benefit of no walks in the first inning. Roers, Grantham (2), Petry (6) and Schlotfeldt. T. Miller, C. Miller (3), Lintner (4), Stremke (7) and Halloran. WP Stremke. LP Roers. Home runs: Skjefte, Eden Prairie; Halloran, Eden Prairie. Spencer Brady had a big night as the Rochester Patriots advanced in the winners' bracket at Red Haddox Field in Bloomington. Brady had five hits, including a homer, while teammates Jordan Rishavy and Brian Ness also hit home runs. Derek Hovick pitched a complete game for the winners. Kyle Figgins had three hits for Grand Rapids. Hovick and Odegarden. Shaw, Schneider (9) and Kleindorst. WP Hovick. LP Shaw. Home runs: Rishavy, Rochester; Brady, Rochester; Ness, Rochester. Matt Puhl of North St. Paul hit a three-run homer in the second inning and also drove in the winning run. Puhl had a total of five RBI. Troy Larson added three hits for North St. Paul Reliever, Sam Humbert, was the winning pitcher. Cambridge finished the season with a record of 25-8. Ramberg, O'Connor (3), Johnson (5) and Valentyn. Gunderson, Humbert (9) and Rubbelke. WP Humbert. LP Johnson. Home runs: Puhl, North St. Paul; Dunbar, Cambridge; Swanson, Cambridge. The St. Cloud 76ers used Adam Johnson's pitching to send Apple Valley into the losers' bracket at Prior Lake's Memorial Park Thursday night. The long balll also played a role in St. Cloud's success, as Collin Stinogel and Nate Laudenbach hit home runs. Elioff, Fangel (1), Lynch (3), Sampson (4), Gretz (4) and Peterson. Johnson and Blitvich. WP Johnson. LP Elioff. Home runs: Laudenbach, St. Cloud; Stingel, St. Cloud. The hosting Burnsville Cobras stayed alive in the losers' bracket with a one-run victory over the Richfield Reds Thursday at Alimagnet Park. First baseman John Means and second baseman Evan Walker led the Burnsville attack with three hits each, while teammates Anders Engberg, John Loeffler and Cody Aasen each had two hits. Catcher Adam Seaman went two-for-two with three walks for Richfield, which finished the season 31-13. Daly, Hinz (2) and Seaman. Larson, Hanson (7) and Harazin. WP Larson. LP Hinz. Center fielder Andy Bartz hit a pair of doubles to spark Edina to a 14-10 victory over New Ulm Gold in a winners' bracket game Thursday evening at Alimagnet Park. Edina used four pitchers: James Dean, Sam Wikoff, Paddy Carroll and closer Will Chen. Ben Wolf, Kyle Fischer and Ben Wolf each had two hits for New Ulm Gold. Dean, Wikoff (3), Carroll (8), Chen (9) and E. Nelson. G. Fischer, Giesen (5), Irlbek (9) and French. WP Wikoff. LP G. Fischer.